The Charleston tour started their east coast swing with a 50-man tournament at Charleston National on Saturday the 25th. The weather was hot and there was definitely some hot golf being played. The Championship flight saw Chris Asbell set the pace early with a 3 over par 75 from the back tees. Chris’ round included a couple of birdies and an eagle on hole five with a 275 yard three wood to eight feet. Phil Pfeiffer from the Myrtle Beach tour finished in second on his first trip ever to Charleston National. In the A flight and playing along with Chris Asbell was Stephen Kauble who fired a great round of 71 which included 5 birdies and an eagle on Hole 9 with a 3iron over the trees to five feet! Congratulations on a great round Stephen! Coming in second was Eric Tobias who posted a great round of 74. Using his home course knowledge Eric played very steady as he usually does and was able to edge out Glenn Powell who posted a solid round of 75. Although they did not finish in the money, Andy Balao and Patrick Gamblin also posted impressive rounds of 76 and 77 respectively, way to go A flight. The B flight saw Randy tame use an even par front side propel him to a very nice round of 78 to take top honors by four shots over Billy Gamblin and John Saager who both posted solid rounds of 82. Billy used his strong back nine to prevail in a scorecard playoff over John to take second place. Finishing just out of the money were Kevin Saylor and Denny Miller who both were one shot out of the top three. The C flight saw our Buffalo transplant Jack Overfield gain his first Charleston Victory with a very nice round of 84. Coming in second with an 87 was Willie Stephens The D flight saw Vince Ackerman settle for second place for a change as Aaron Chase had his best round of the year with an impressive 86 to take a five shot victory over Vince and Cowboy. This was a nice field event and we should continue with the bigger crowds as we look forward to the top course remaining on the schedule. Our next event is the Southern Regional @ Kiawah which will be a 120 player field. After that is a limited field event at Orangeburg Country Club on Jul 23rd. Please sign up early for this event. 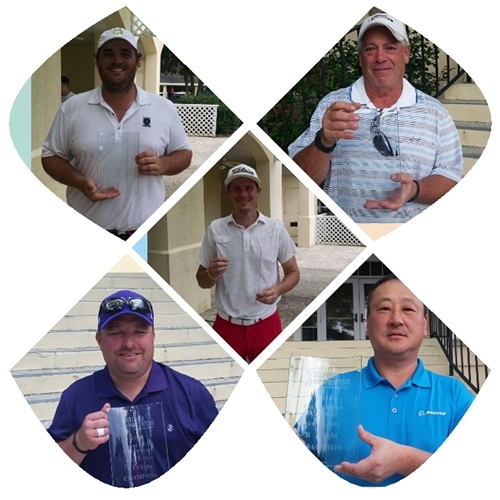 There were five Super Skins at Charleston National, Two Eagles by Chris Asbell and Stephen Kauble and three good birdies by Patrick Gamblin, Jack Overfield and Randy Gillum. The closest to the pins were won by Tony Capehart, Mark Ducker, Chris Asbell and Jack Overfield Also want to point ut there was 57 Birdies and two eagles made during the tournament! !